Ransomware attacks are evolving at an incredible pace and are becoming complicated than ever before. Ransomware is not going away and, in fact, is evolving every day- making it much more difficult for security products to avert these threats. Cybercriminals are using more sophisticated technology to hack computer and data. The internet has gone wild in terms of cybercrime, so we should protect ourselves against it on a regular basis. What can you do to prevent ransomware? First, you must understand how ransomware spreads, so, that, you can take the necessary precautionary measures against it. Spam is the most common method used by cybercriminals to distribute ransomware. It is generally delivered using some form of social engineering wherein users are tricked into downloading a malicious e-mail attachment or clicking a malicious link. The ransomware is usually disguised as a legitimate email attachment and sent to unwary users. If the user opens such email attachments, it can lead to an infection. Another way used by cybercriminals is hiding the ransomware links in a link button or the body of the email. When clicked, it then redirects the user to a malicious website that leads to an infection. Hence, it is advisable that you verify the authenticity of any file or email attachments from unknown sources, before opening it. Another common method used for delivering ransomware is through exploit kits. These are software packages that are specially designed to identify security vulnerabilities in the victim's computer and exploit them to install ransomware. In this exploit kit type of attack, cybercriminals insert codes on a seemingly legitimate website that redirects victims to a malicious site. Unlike the email spam method, this method doesn't require additional actions from the victim. This method is also referred to as a 'drive-by-download' attack. 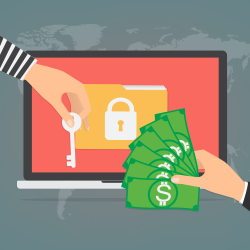 Cybercriminals lure unwary users to download ransomware by hiding malicious ransomware codes within cracked versions of different software such as games, adult content, online game cheats, and many more. Download files and other software only from legitimate websites. Do not open links, suspicious emails or attachments from unknown sources. Most important of all, download and install a good antivirus program like Comodo Antivirus. The best way to prevent ransomware is by using Comodo Antivirus. In case of organizations, Comodo Advanced Endpoint Protection (AEP) is the ideal solution. With a powerful containment engine that automatically contains all untrusted processes and applications in a secure virtual environment, Comodo AEP provides complete protection against any malicious software including ransomware. For unknown files, Comodo’s local, and cloud-based Specialized Threat Analysis and Protection (STAP) engine provide a verdict (good or bad) almost instantly. Comodo AEP can quickly identify and eliminate malware (including ransomware) across endpoints without affecting end-user experience. Try Comodo Comodo Advanced Endpoint Protection today! For more information on Comodo Advanced Endpoint Protection, contact us at EnterpriseSolutions@comodo.com or +1 888-256-2608.